I’ve found the perfect way to stay hydrated and energized during a blogging conference, trade show or any event where you need to keep your star-power bright. You’re going to want one of these, especially before all the spring-time travel begins! This is the best water bottle ever! My good pals over at Dexas International know me soooo well. They know that I’m always on the go… or just playing catch-up with my crazy life. Drinking lots of water is the name of the game (as we all know), but having something healthy to eat when you are on the verge of your next meal is just as important (that’s when we make bad choices… or at least I do). Dexas has the answer: The Snack-DuO water bottle… the only bottle that has two side-by-side chambers: one to hold whatever you like to drink, and another to hold a snack. And, before I continue, because this is important, the Snack-DuO is made of Tritan™ copolyester, a BPA and BPS-free plastic. No bisphenols in this high impact-resistant bottle! Good to know, especially because there’s so much talk about the risk of using plastic water bottles that aren’t BPA free! Do you workout or go to the gym? I really try (key word: try) to work out everyday. I know that after a workout I need to eat something… especially something healthy. Before I work out, I fill the snack-side of the Snack-DuO with protein bar bites, trail mix or almonds. Okay, sometimes I fill it with M&M’s, but that’s only sometimes. The bottle is watertight and holds 12 ounces of liquid. The snack chamber holds 1½ cups of your fave snack, which is more than a serving size of most healthy snacks. Love that the Snack-DuO is also dishwasher safe. The Snack-DuO is great for commuting… or for making sure the kids have a healthy snack before their after-school activities! 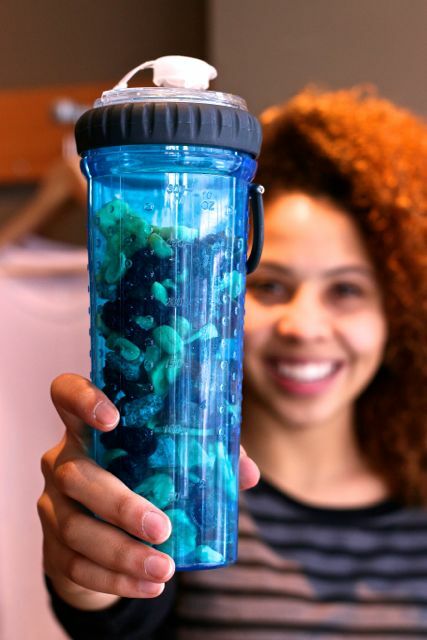 Now… doesn’t this sound like the best water bottle ever? Order your Snack DuO here! It is indeed the best water bottle ever! It is amazing to be able to combine liquid and snacks. Thanks for linking up to the Bloggers Brags Pinterest Party. I have pinned your post to the Bloggers Brags Pinterest Board. Thanks so much for the Pin and for stopping by. I love my water bottle… I’ve got to quit filling it with Skittles, though. I love this! I am definitely going to grab me one. I really wished I had thought of this.. it is such a marvelous idea. Thanks for stopping by, Carrie! Wow! That’s pretty cool! I can sure see where this would come in handy. I walk my dogs on a long walk every day and sometimes end up feeling pretty hungry by the time we get back. Then end up eating the first thing I see, not always the healthiest choice. I don’t like to carry more than my water bottle, as we go at a pretty quick pace. This would be a great way to have both a snack and my water, and still just the one container! Thanks for sharing it on Wonderful Wednesday! It is great for long walks or hikes so that you can have a little nibble while you are on the road. Thanks for saying hello… let me know if you get one and how you use it!